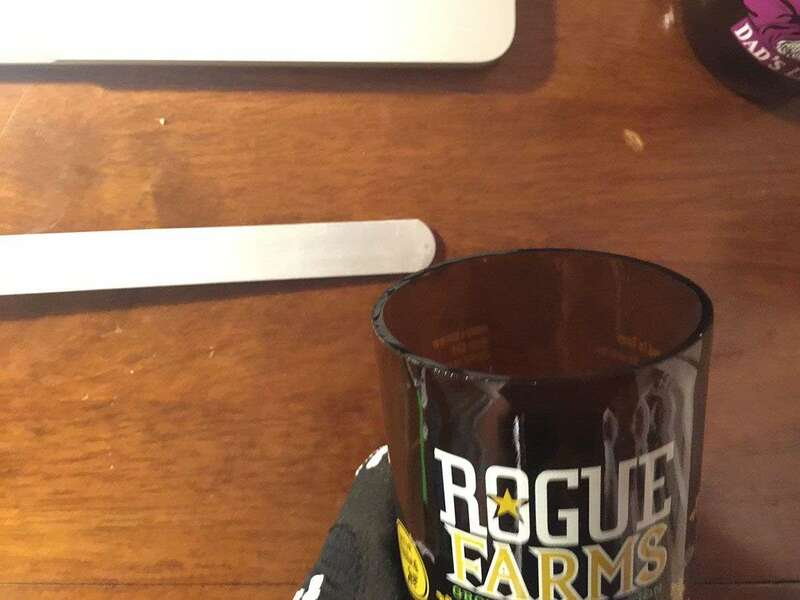 What better to fill with beer than an empty glass that was once filled with beer? 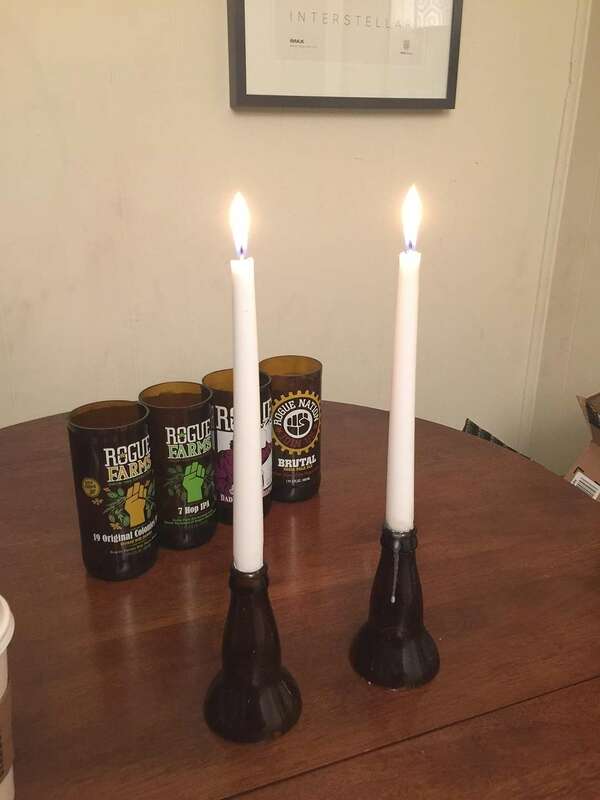 Keep the beer flowing and create a beer infinity loop by turning old beer bottles into glasses. Also, it's a good excuse to get drunk and then use sharp tools to cut glass. 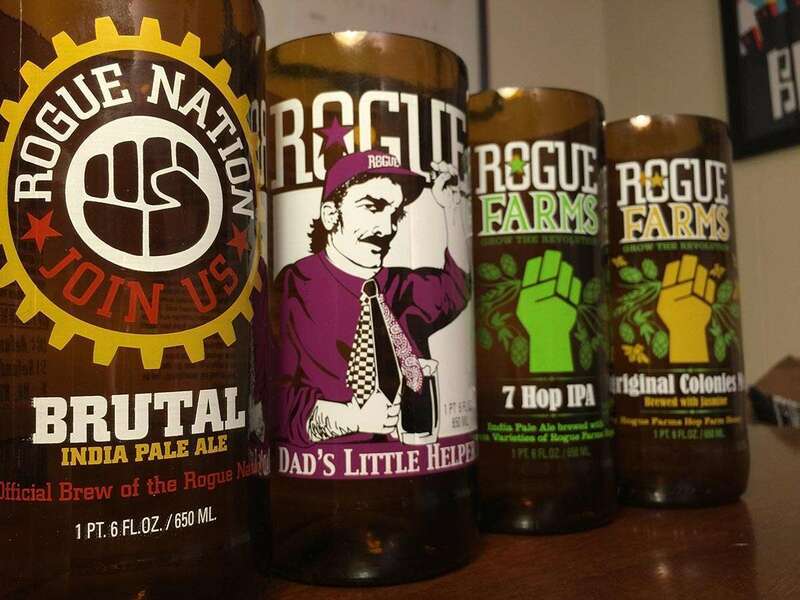 Because some people like to jump right to the end, this is what your pint glasses will (hopefully) look like. Bottles with paper labels are no good; you want to choose bottles which have the label "painted" directly on the glass. If you can peel it off the bottle with your finger, it's no good. 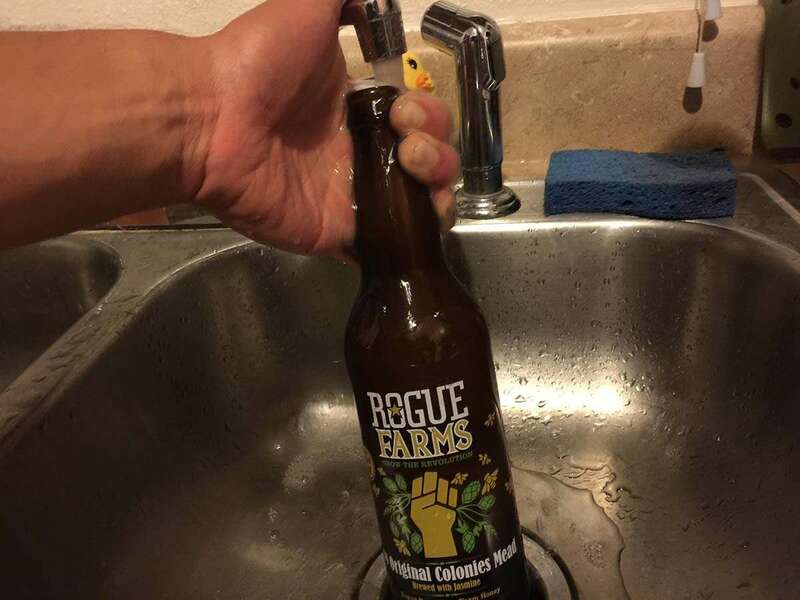 I chose Rogue since they always come with labels printed directly on the bottle. Also, their bottle art is pretty good (as is their beer). Drink the beer rapidly and furiously. 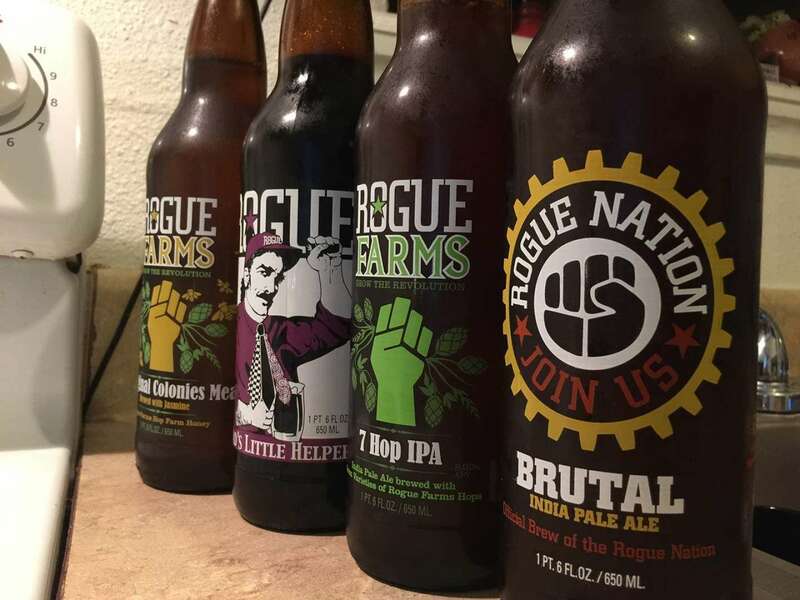 Enlist the help of friends to accelerate beer consumption. Clean the empty bottles using soap and water. This will help to keep your glass cutting tool clean. The positioning of the bottle art will determine where to make your cut. Art positioned further away from the neck will afford you a greater range of cutting possibilities, opening up the option to make a cut based on volumetric measurements -- such as creating an actual pint glass (16oz). I'm going to disregard the final volume of each glass to maximize the cup's aesthetics. 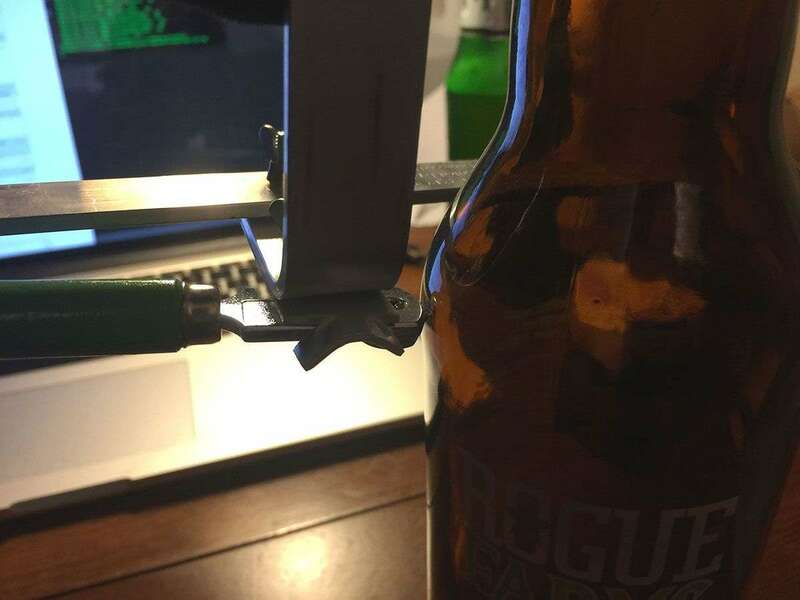 Adjust your bottle cutter to the desired position of your cut; this step varies by glass cutter manufacturer, but should be easy to figure out (or RTFM). 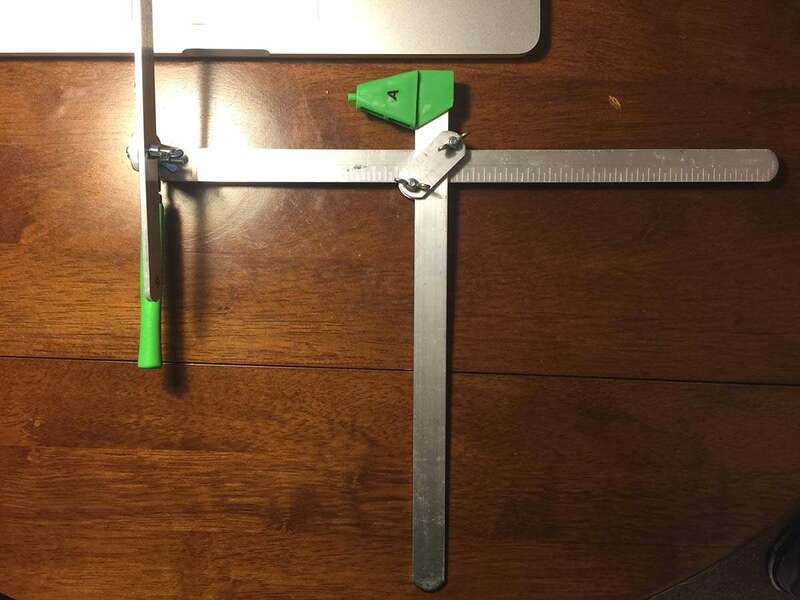 It is important that the cutting blade be perpendicular to the cutting surface. In other words, if you're cutting on a curved portion of the glass, your blade should intersect the glass at a point that would best form a 90-degree angle to the curve of the glass. 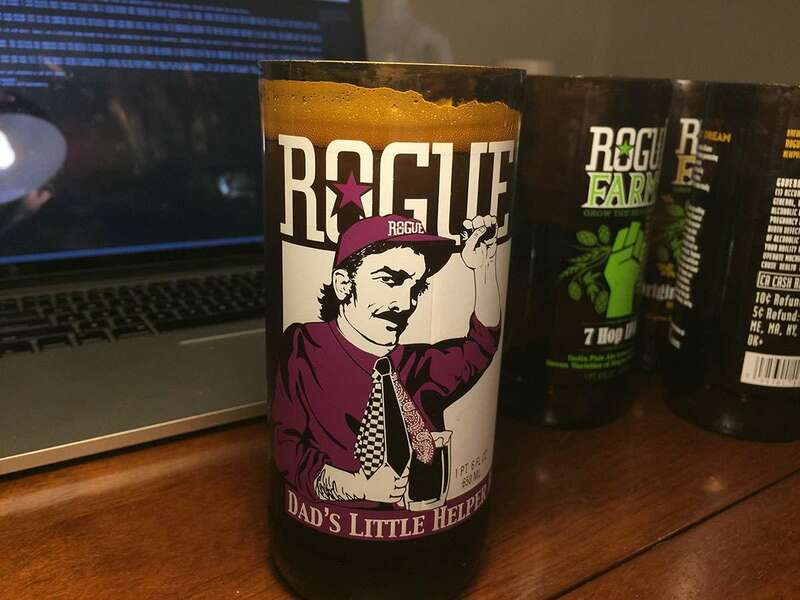 If you'd like to make the final product an actual 16oz pint glass, you can use use the cylinder volume formula to determine exactly where to make your cut. Remember that you need to use the inside diameter of the bottle to determine radius, and take into account the "dimple" that exists at the bottom of most bottles. If you want to be lazy or are too drunk to do math properly, use a measuring cup or beaker to measure 16oz of liquid, pour it into the empty bottle, and use a marker to mark your cut spot. You may want to start with a "test" bottle for practice, but this is completely up to you. I went through three test bottles before I got the process down. Initial results were less than stellar. In glass cutting, the lighter the score, the better the separation will be. If you score too deep, separation cannot occur. If you go over your original score mark, you will have issues as well. Your goal is to produce a continuous, barely audible scratching noise when making the cut. Clear the room of noisy artifacts. Apply a small amount of light oil to the cutting blade; I used bicycle chain lubricant since I had it lying around. Now, holding the cutter securely in your hand, rotate the bottle until you've made one full rotation. You should hear a faint yet continuous scratching noise followed by a gravelly noise when you've circled the bottle entirely and ended up at the same place where you started your cut. Inspect your work: you should now see a thin, hair-like score surrounding the bottle. If you accidentally "skip" an area while making the score, go back and re-score that area only. We're going to give the bottle a hot/cold bath to separate the sections which you've scored. The sudden temperature change will cause the bottle to separate perfectly wherever you've scored the glass. It's important to note that you'll need a pot deep enough that you can submerge the bottle vertically (open side down) until the score line is completely covered. 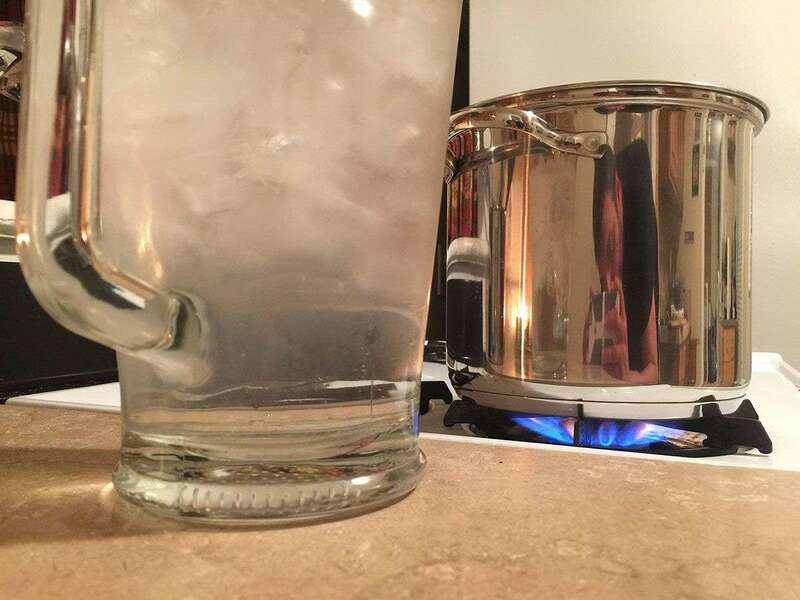 Fill the pot with water and heat it on your stove. Use enough water that you can submerge your score line completely. Your empty bottle has volume, and that volume will displace an equal amount of water. If you fill your pot too much, the boiling water will overflow when you submerge your bottle. After it's heated to boiling, turn it down to simmer. Use protective gloves so as not to burn your hands horribly. Now for the cold bath: fill a container with ice and water. Again, use a container deep enough that you can submerge your score line completely, remembering that your bottle will displace a certain amount of water. Place the cold water apparatus near the boiling pot of water. Use the ice water to cool your hands if you burn your hands horribly. Using your protective gloves, submerge the bottle vertically, open side down, into the hot water until it completely covers the score line. 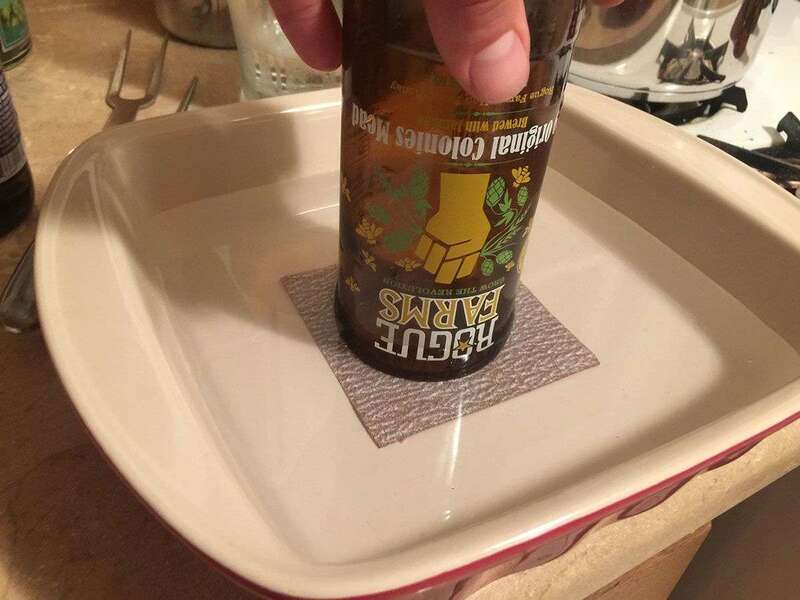 Hold it in the hot water for 5 seconds, and then immediately submerge it in the cold water. Hold it in the cold water for 5 seconds. Repeat this process until the bottle separates at your score line. You will hear a small "pop" as the sections separate. I wasn't able to take a photo of this step since my hands were both occupied, but attached is a photo of the final result. The sections may separate when the bottle is either in the hot water or the cold. Be careful. If the bottle still has not separated, you can use your glass cutter's included tapping tool to tap the bottle from within to separate the sections. This is not preferable but usually works. To prevent cutting your mouth and looking like a meth addict, you will now sand the sharp edges which you've created on your beautiful cylinder. Use the sandpaper that came with your cutter to accomplish this. Normal sandpaper also works great. Place some 60-grit sandpaper in a shallow bowl and then fill it with water. Using a combination of circular motions and rotations, slowly rub the sharp edges of your new cup on the sandpaper. Always ensure that the portion you're sanding is submerged in the water. Sand the inner and outer lips as well since these will both make contact with your mouth. Finish the sanding off with some 120-grit sandpaper for a smooth, sweet finish. If your cutter didn't come with sandpaper, you can pick some up at the store. Don't do this drunkenly or suffer the mighty wrath of the local jail. Wash the glass sediment from your new glass and celebrate a job well done! Now, what to do with these bottlenecks? I turned them into candlesticks. 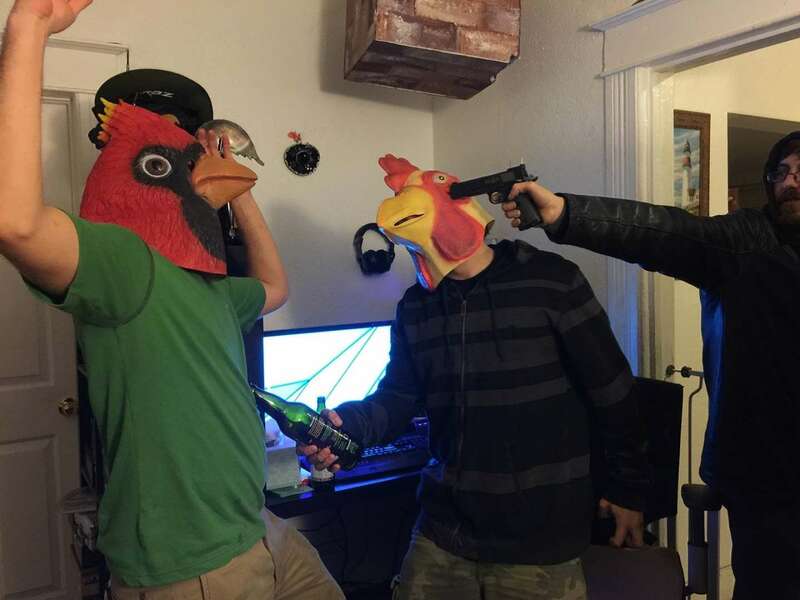 This part is pretty self-explanatory.